Updated: 10/25/18 Are you limited on space in your kitchen? Aside from a sharp knife, cutting board and good pan, there are a few other tools that can help you in your quest for easy food prep and healthier eating. Measuring Spoon and Cups Make no mistake, these aren’t just for measuring ingredients for your recipes. A nice set of measuring spoons and cups will help you practice portion control. 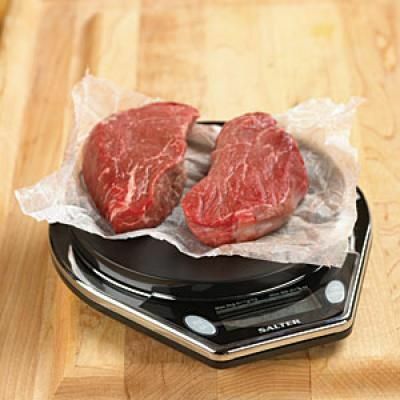 Kitchen Scale For Weight Loss A kitchen scale is perfect for items that can’t fit into a measuring spoon or cup. A kitchen scale won’t break the bank (less than $40), but it will help you learn how to portion proteins or measure items based on weight instead of volume. Do you really know what 13 ounces of quinoa looks like? The scale doesn’t lie. Slow Cooker You may think of it as a tool for busy people instead of a weight loss gadget, but really it’s the best way to ensure your meal is ready when you are. No more grabbing convenience foods the minute you rush through the door. Not to mention, who doesn’t like a nice, hot, home-cooked meal? Soups are delicious and lean proteins are incredibly tender. Mini Food Processor Chip, whip and blend – on a smaller scale. It’s still easy and fast, but it takes up far less storage space with the same results. Collapsible Steamer Want to know the easiest, fastest and healthiest way to cook vegetables? Steam it! Steaming keeps the nutrients in the food, rather than losing them in the water. For under $10, you can find a collapsible steamer that can fold up to the size of a salad plate. You can find some great deals online or at your local kitchen store retailer and many will often honor online coupons! Happy prepping!